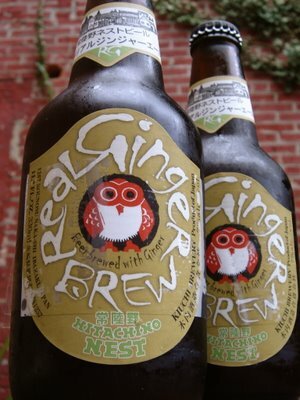 I'm a big fan of ginger, so when I noticed a two-pack of Hitachino Nest Real Ginger Brew at Whole Foods, I had to bite. Produced by the nearly two-centuries-old Kiuchi Brewery in Japan, the ginger brew delivers a pleasing spicy bite. On first sip, it reminded me of the way beer tastes when you're eating sushi — bite of ginger, sip of beer, hit of soy. At 7 percent alcohol, this is a very real beer, not a ginger ale. According to the label, the flavor comes from fresh ginger root, which is added to the brew kettle. Its spiciness and full malt flavor also make it a perfect drink for the holiday season.